Having the right tools to eliminate a bed bug infestation is essential to your success. Our new bed bug kit includes the most advanced arsenal we have ever compiled encompassing all three professional classifications for effective treatments including Contacts, Residuals and Powder. Each product in our kit is designed to work in a specific area in order to accomplish the goal of treating harborage areas while at the same time establishing a residual defense for up to 2 weeks. Our exclusive kit is the latest on the market as it now includes the newest formulation of Bedlam ensuring you will not come across resistant strains of bed bugs. This kit contains enough product for 3 complete treatments. Includes the newest formulation of Bedlam - Bedlam Plus - which kills all strains of bed bugs including the more difficult New Jersey and Ohio strains. Our complete bed bug kit includes all the powders and sprays needed to treat your home like a professional throughout the initial treatment as well as 2 follow up treatments. Powder and spray treatments are broken down into 3 key segments, which include: Contacts, Residuals and Powder. These key components make up a cocktail approach that effectively and quickly knockdown the population while establishing a long lasting residual defense. The first key component included in our kit are our contact killers JT Eaton Kills Bed Bugs and Steri-Fab, which uses natural pyrethrum and an alcohol based synthetic pyrethroid to kill off a large percentage of the population within the first 24 hours. Although contact killers do a great job to knockdown the population, they only last for up to 24 hours. JT Eaton Kills bed bugs is used in cracks and crevices and along the baseboards while Steri-Fab used to treat the mattress before encasements are applied or to treat carpeting or floors, furniture and other more delicate items. SteriFab is popular because it can be applied easily and dries quickly leaving no residue behind. The second key component necessary to kill bed bugs are residuals, which kill slower, but remain active for a longer period of time (1-2 weeks). Included in the kit is the all-new Bedlam Plus, which is the most recent formulation against bed bugs and currently has no resistant strains of bed bugs (please see our illustration of the bedroom below showing areas where each spray or powder may be used). Bedlam Plus is labeled to be used along the folds and tufts of mattresses and box springs and can also be used to treat other fabric items such as sofas, chairs and the edges of carpeting. Bedlam Plus should be sprayed only in areas that will not come into future contact with skin (for example if your treating a sofa spray the edges and bottoms of the cushions and not where you sit). Bedlam Plus establishes a long lasting residual defense that will kill bed bugs for up to 2 weeks. Bedlam Plus can also be used along baseboards, cracks and crevices. The final key component included in the kit is powder. Powder is used to set up a perimeter defense within the walls, cracks and crevices where bed bug may cross over. Included in the kit is a professional powder application allowing you to gain access into tight areas including inside the walls by access of the electrical plates (always ensure the power is off before removing the electrical plates). Powder can also be used between the carpeting and the baseboards one the residual and contact sprays are fully dry (you don't want to get the powder wet or it will not work). The bed bug kit includes enough sprays and powders to complete 3 full treatments every 2 weeks. This ensures that all bed bug life cycles including the unborn bed bugs that were still in their eggs at the start of the treatment will be killed. This kit is intended to be used in conjunction with our Bed Bug 4-Step Protocol that includes mattress and box spring encasements, Climbup Insect interceptors and preferably a steamer. Always read and adhere to the instructions on the product's label to ensure proper and safe usage. JT Eaton Bed Bug Killer is an excellent contact killer harnessing natural pyrethrin and a fine evaporating oil base to kill any strain of bed bug fast. This is important when dealing with an initial treatment to knockdown a good portion of the population within the first 24 hours. We like to use J.T Eaton Red in areas that do not come in contact with your skin including cracks, crevices, baseboards etc. Application: Spray mattresses lightly, particularly around tufts and seams. Take beds apart and spray in all joints. Treat baseboards, moldings and floors. Repeat treatment as needed. STERI-FAB has been used as an effective contact bed bug killer for many years and is popular for the fact that it evaporates within minutes leaving no residual behind. We like to use STERI-FAB to treat more sensitive areas like areas that enter in contact with your skin, like mattresses, sofas cushions, chairs etc. Application: The infested areas should be sprayed thoroughly and repeatedly, directing the spray into all crevices, cracks, hiding places, seams, creases and folds. 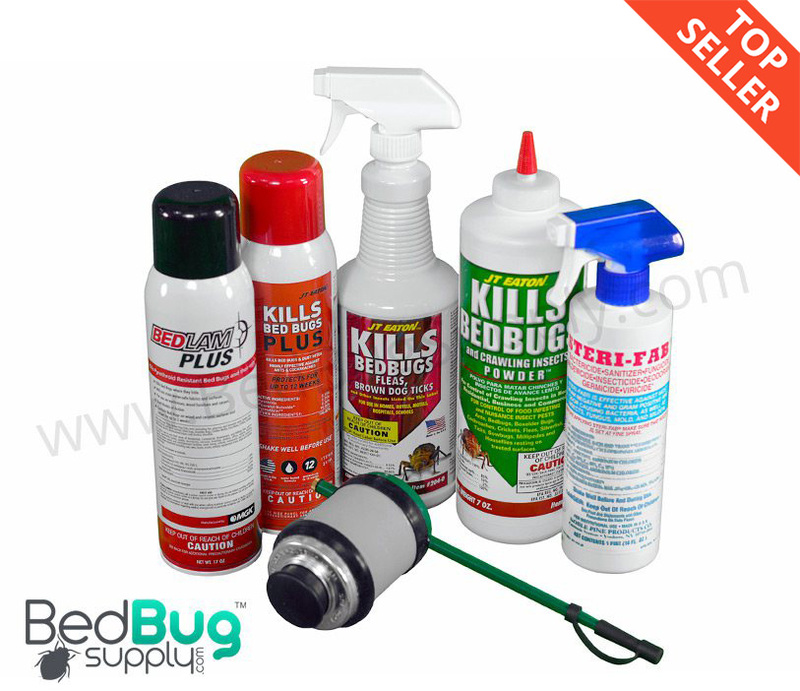 Unlike most bed bug kits on the market, our kit includes the Newest formulation of Bedlam called Bedlam Plus. Bedlam Plus is a new aerosol insecticide by MGK offering a longer lasting residual than the original Bedlam with the addition of Imidacloprid. This longer lasting residual additive along with an updated formulation gives Bedlam Plus the ability to kill all stages of bed bugs, their eggs and even pyrethroid resistant bed bugs for up to 2 weeks. Application: Apply on or around baseboards, cracks, crevices, bed frames, box springs, headboards, bottoms of seat cushions, moldings, edges of the carpet and picture frames. Allow spray to dry before reuse (always review label for complete information). JT Eaton Kills Bed Bugs Plus is the latest spray by JT Eaton offering up to a 12 week residual in a convenient aerosol form. It's non-staining water-based formulation can be applied to sofas, chairs, mattresses, curtains and carpeting. Application: Apply on carpets, furniture, tufts and folds on mattresses, drapes, cracks and crevices. Allow spray to dry before reuse (always review label for complete information). JT Eaton Natural Bed Bug Powder kills bed bug by attaching itself to the outer shell of the bed bug where it dehydrates and kills the bed bug. What's great about the powder is there are no resistant strains of bed bugs to this treatment and it's all natural. Another great feature is unlike other powders it will continue to kill indefinitely unless it becomes wet. Application: Apply on and around hard to reach areas and places where sprays cannot be used including behind appliances, inside electrical outlets (not where you put the plug) and behind picture frames. Can also be applied to inside the walls to help prevent bed bugs from spreading. The Bed Bug Powder Applicator is key to spreading bed bug powder into hard to reach cracks and crevices. Q: I have bed bugs. an exterminator came 5wks ago but they are still here? will this kit be effective? This kit is not intended to be an all-inclusive bed bug treatment solution. It is only part of our recommended 4-step solution, which covers a more thorough and holistic treatment process. The products included in this kit are generally safe for mammals such as your cat. However, you should remove all pets and children from the area before you begin your treatment, and no one should come in contact with treated surfaces until those surfaces are fully dry. Q: Can I safely use this product if I'm pregnant? What precautions should I take and for my 4 year old daughter. The kit is safe if used as instructed, but you may want to consult with your doctor first if your pregnant just as an added precaution. All of our sprays and powders are labeled for indoor usage and registered with the EPA. Q: How long would it take all applications to dry completely before animals and humans come around? That depends on the surface and the product itself, but generally it'll be dry within 1 to 3 hours. You can always test the surface by poking it with your finger, as long as you wash your hands after if it does turn out to still be damp. This is a proven combination of contact and residual chemicals, which are meant to be used alongside other nonchemical treatment methods. Check out our complete 4-step solution for maximum effectiveness. Q: Does the products in the kit, Bedlam Plus, Streri-Fab or JT have an odor or leaves a residual odor. In vacuuming these powders up after time, is there any medical concern? All of the products in the kit leave little to no odor if applied properly. No powder should be applied so excessively that it needs to be vacuumed. Please read and follow the included instructions. This kit included all the powders and sprays that we needed to get rid of bed bugs. Instructions on the website were helpful and so were the people when I called. Reviewed by: Barb from New Jersey. The kit includes what you need and the videos are helpful. Reviewed by: Max from Brooklyn, NY. I was very satisfied with your product. The package I chose had everything I needed and took care of the problem. Reviewed by: Julie Harless from Marion, Ohio. I had a very pleasant experience looking & purchasing the right product that would (hopefully) solve our bed bug problem at bedbugsupply.com. Their web store are laid out well and easy to navigate. Products and step by step treatment procedures were properly explained in a video. They shipped my order within 24hrs and had it delivered on time. I have yet to find out the effectiveness of the products (and treatment) for I am still on the first stages of treatment. But I could say that as early as now the 'signs' have drastically diminished. I am very hopeful their product/s is/are effective and will ultimately solve our problem with bed bugs. Reviewed by: Nicko from Oakland, CA. Just received order; tried Kills Plus...work good, kills fast. Would be great to have some instructions for use of kit products; i.e. what to apply first, second, etc. Reviewed by: smrichards from tampa. I've started the 5 steps to eliminate bedbugs using the Professional Bedbug Kit. 3 days using the products and no bites or seeing any bedbugs. I highly recommend this bedbug treatment. Reviewed by: Mr David Rose from United states of america. You never realize how much of a blessing true rest is until you have bed bugs. Searching for the right treatment was really hard, but I'm so grateful that I found you guys (Bed Bug Supply). The night of the first treatment I was able to sleep without the fear or being bit and not waking up from it actually happening. Such a relief to finally dream again and to get a full nights rest! Spraying everything was easy, just read the directions on each bottle and follow the detailed how-to videos available on this website. Next week is my second dose of treatment, and I'm keeping my fingers crossed that this is going to be the last time I see these nasty things! Reviewed by: Kelli from Indiana. I would love to review this purchase but unfortunately I never received the product! What I did get for my hard earned cash was the most awful customer service ever!!!! Rude and very despicable! I will never acquire your services again or recommended your company to anyone! Reviewed by: Ramika Evans from Cleveland Ohio. The product arrived sooner than expected and was professionally packaged and shipped. As soon as I started using the products, I noticed a difference almost immediately. Within 2 days, about 99% the little devils were gone. Great product!! Reviewed by: Michael from Maryland. Reviewed by: lynn from mo.